Fact- Every profession, whether of a teacher, soldier, tailor or shopkeeper, is noble, if done with sincerity and integrity. A careless doctor can kill one, a careless driver can kill dozens, a careless engineer can kill hundreds. Fact - money is an important measure of success. Running after it is not good for anybody, but earning more money by doing more work is not a moral crime. And all who advising doctors, themselves running after money, aren''t they? Fact- doctors do not come from mars or venus. If a few supreme court judges or army generals can be corrupt, so can a few doctors be. That does not make the whole medical community bad. Fact- doctor patient relationship is based on trust, if you do not trust your doctor, go to another one. Medical science is a life long learning process, and all treatment, to some extent is based on trial and error. The same medicine, which works for one patient may not work on another. Second, the responsibility of providing quality drugs at affordable prices lies not with the doctor, but with the state authorities, just like providing for better roads, unadulterated quality food and dairy products, uninterrupted power and water supply etc and etc. Like cloths, cars and mobile phones, costly drugs are generally better than cheap ones. However, if the government makes it mandatory to write generics, it should ensure quality and the consequence of poor/non efficacy should not be blamed on doctors. Third, tests are done for patient’s own safety. Just like wearing a helmet or seat belt, investigations increase the safety. Most of the doctors in india are trained to work on clinical hunch and common sense and not rely too much on tests, and advise much less tests than what is actually written in the book or done in the developed world. Fact- The professional fee of doctors is just one fraction of the treatment costs. Increasing patient expectation for healthcare outcomes, rapid advancement in technology and equipments driven by years of costly medical research, for profit corporations running healthcare establishments are other factors which drive the costs. Fact - doctors are as human as can be. They also get tired, fall sick, have family commitments, get upset and stressed sometimes and can suffer from all the frailties of a human being. If anyone wanted to be treated by the God then they can simply visit their place of worship. 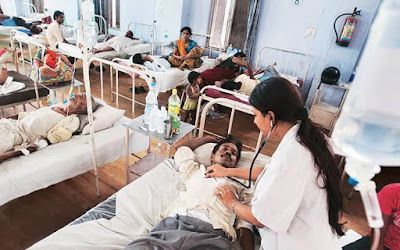 This post is not meant to be objective and politically correct, but it is very subjective and carries a perspective of the ever tortured community of doctors in India having to bear the burden of government's' inability to provide proper healthcare to its people. There is a clear mismatch between the declared objective of universal healthcare through the public health system and the actual level of government expenditure. The doctors always being in frontline have been made easy scapegoats and poster boys for what is all wrong with our healthcare. Starting from the issues of never ending lifetime service bonds in exchange for medical education to draconian bills like KPME amendment bill 2017 (which is being tabled in karnataka assembly) shows how systematically the government is putting all the burden of its impotencies on the shoulder of India's doctors.